I have been following this forum for quite some time, especially the Super Heresy treads. Until this sunday I have been listening to a pair of RP-160, but a good deal on a Heresy popped up near me and I had to take the chance on them. Living in Denmark Klipsch are a rare and expensive bread. 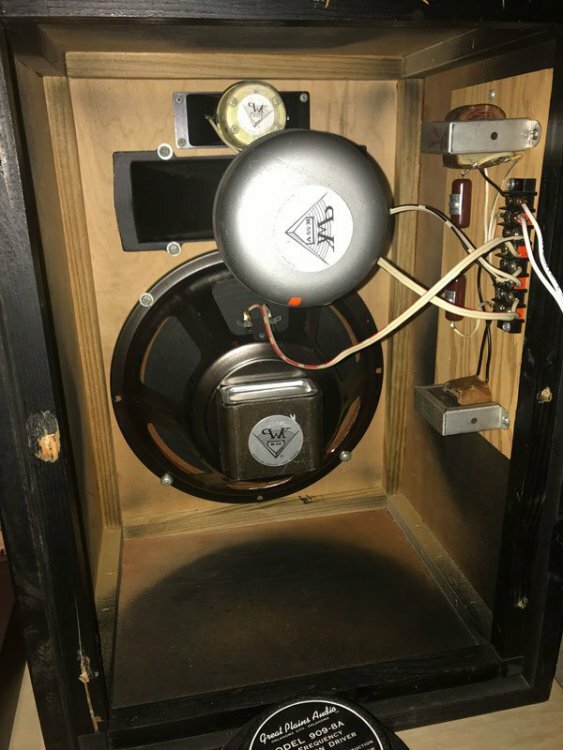 The speakers sounded nice when demoing them at sellers house, but I didn’t get the chance to look inside the cabs before getting them home. Actually they did sound super fun. Much more snap and “live” feel than the rp-160. Inside it looks all original, k77 tweets, k55 mid push terminal, k22 woofer and the relatively rare Type D crossover. Unfortunately, after getting home the left channel started making distortion noises and and clicking sounds. The right one did to actually, but much lower, and this is where I need advice on troubleshooting the issue. I ran some sound sweeps and am pretty sure the offending sound comes out of the K55. cracking little guy that amp by the way. 3. Swapped out the k55 with a pair of GPA 909. This I did to figure out if the diaphragms in the K55 was off, but the skratching distortion was also present with the GPA. And the issues was still more prominent on the left channel. I am suspecting the issue lies in the crossover then. The caps are original brown Type D ones after all. This makes them 40 plus years old? I have some 2mF Solen caps on the way. Down the road I might go the Super Heresy path, but first I want to iron out the problems and enjoy the originals. What now o wise ones...? Welcome to the forum. Have you loosened and re tightened all the screws on the crossover yet? Thanks for the suggestion CEC. did double check the screws, but didn’t actually unscrew them first. Will try. It sound like the wires intended for the woofer got accidently swapped for the wire intended for the mid (squawker). Sounds like the source is causing it.....are you using separates source pre-amp .amp??? If they sounded fine at sellers house only thing that changed was the source material right ? @kink56The woofer wires are going to the k22. Pretty sure about that. @ricktate good point. The source is the same as the sellers house. I brought an iphone and ran it straight to the amp. This way I knew the music, and controlled the volume with spotify. Not ideal but it works. but I did also test at home with a yamaha receiver and apple tv as source. Got the same issue. He said he swapped wires and the problem stayed with the speaker. One good, one bad. It should be easy to figure out if he has one good speaker. He can swap components and see what happens with the issue. I really think that loosening and tightening all the screws on the crossover should be the first step. It's fixed more than one speaker and seems to occur more often than not after transportation. Very thorough (absent connection breaking/re-making) and logical examination. Both mids, one more than other show symptoms. 40-year-old equipment transported. If it's a crossover component(s), yet to be determined, it's unlikely that between caps and coils it's the coils. tonight I'll swap the crossovers and see if the noise follows the left crossover to the right speaker. I'll also retie the screws in the process. a couple of pics from the inside. Welcome to the forums! GPA 909s... nice! Those look like rebuilt crossovers. 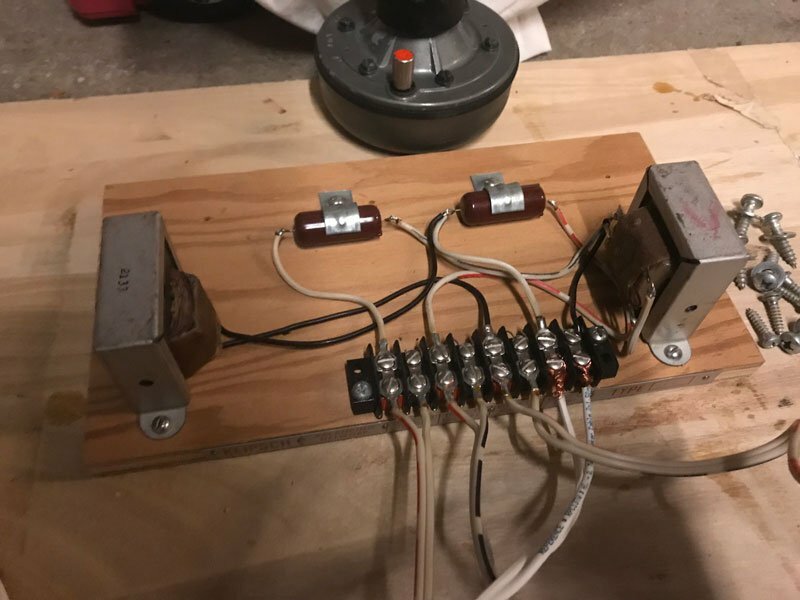 Can you redo the solder connections on the crossover? First, Carl's suggestion to loosen and retighten the screws. Those capacitors look like crappy ones and the coils = '''transformers''' never go bad. 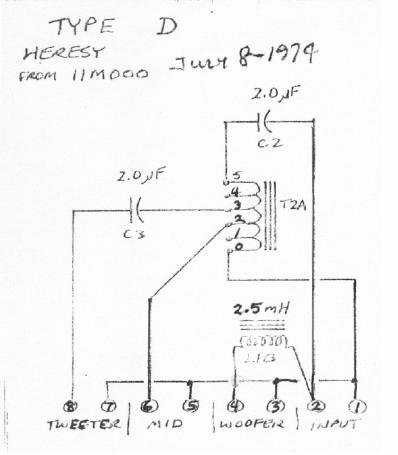 Heres the schematic for it. Notice the polarity on tweet and squawker. 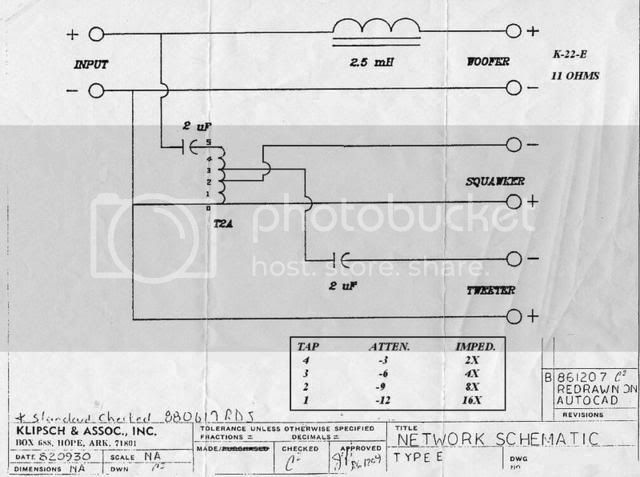 Heres the schematic for it. that's the wrong one... he said it has a Type "D". It's the same, but no reason so muddy the water. did swap the crossovers and retied all the screws. 2. the problem seemed to have followed the crossover to the rigth speaker. now, I am beginning to supect that the ticking scratching sounds is comming from my digital sources and the Heresy are simply to sensitive and are picking it up. But on the other hand I am looking at those sad brown capacitor lumps and they sure don’t help matters. I am just glad some fresh ones are in the mail...no sense in overthinking it now till I have at least a recapped crossover. By the way type D and Type E, aren’t they the same just with the positive and negative inverted at the k55? The plan is to take all the guts out and sand the cabs. that I can do. The previous owner did paint them black, but are originally walnut veener. I am beginning to supect that the ticking scratching sounds is comming from my digital sources and the Heresy are simply to sensitive and are picking it up. nah didn't pop up at sellers house, but I wasn't playing to lound either. not that I am cranking the volume up normally. Yeah, but you can always use that event as a benchmark. So long as you never do anything that bad again, you're golden, whatever it may be "this" time!